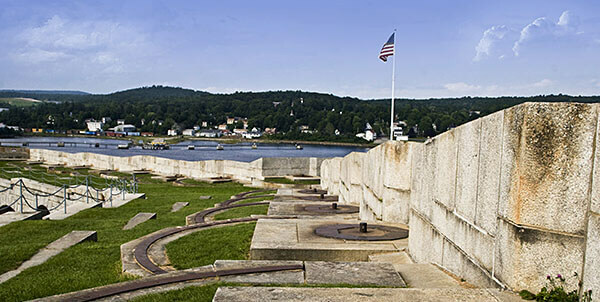 Fort Knox, in Prospect, Maine, has been nicknamed “America's First Fort”. It was constructed during the Civil War era, along the banks of the Penobscot River, and was completed in 1869. It was named after Henry Knox, the first US Secretary of War. 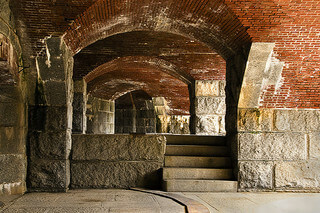 It is notable in that it was the first fort in the state to be built out of granite, rather than wood. This made it durable and solid, and though the fort never saw action, it was intended to protect that area of the river and the city of Bangor, Maine which was where the majority of Mainers obtained wood to build their homes. In 1970, it was declared a National Historical Landmark. In 2006, the cable-stayed Penobscot Bridge was installed across the river and the Fort. At the center of the bridge stands a 420 foot tower, which has an observatory at the top which allows to visitors an impressive 40 mile view on a clear day. To get to this height, visitors are able to experience a ride on Maine's fastest elevator, taking only one minute to ascend to the 43 story high observatory. The Penobscot Narrows Observatory is accessible only though the grounds at Fort Knox. Visitors are welcomed to the Fort from May 1st through October 31st, daily from 9 AM until sunset. These hours are good 7 days a week including holidays. You can elect to purchase a ticket to explore the Fort itself, or buy a combination ticket, which also allows access to the Penobscot Narrows Observatory. The Fort also is included in the list of locations that the Park Pass allows unlimited access to. Halloween is an especially exciting time at the fort, with the last few weeks of the month celebrating “Fright at the Fort”, where the fort is transformed into a haunted house. There seem to be spooks abundantly at the Fort, with many staff reports of unexplained sights and sounds, which has been examined by many local paranormal research teams. It is rumored that the Atlantic Paranormal Society (TAPS), stars of the popular television show “Ghost Hunters” have shown interest in formally investigating the fort. If it's more family friendly pursuits you're looking for, you won't be disappointed. You are allowed to bring leashed pets and picnic lunches. There is also ample seating in both sunny and covered spaces. Summer camps, and other large groups, are welcomed to come to the fort for guided educational tours and the Fort happily provides access to the public who may wish to hold weddings, birthdays and other celebrations outside of the Fort's normal operating hours. May 1st through October 31st, daily from 9 AM until sunset, 7 days per week. Last updated by jack on 06 December, 2012 in Destinations. This looks like a fascinating place to visit! Living so close to Maine in New Brunswick I really need to check it out soon.